Doug is a great person to speak with. Doug was in New York rehearsing with The Dead Daisies for their upcoming US tour when I spoke with him. 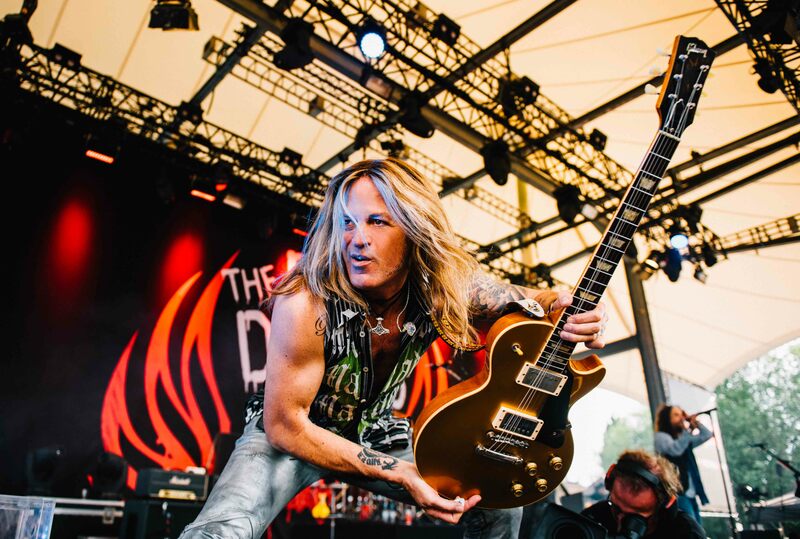 I spoke to him about The Dead Daisies, Burning Rain, the addition of Dean Castronovo and his new Suhr Guitar. Were you the one who recommended Deen to drum with the Daises? DA: A couple of weeks ago, Deen and I played one of the songs Freedom. We did a little jam together in Los Angeles with Todd Kerns From Slash’s band the Conspirators. Deen sang while Todd played bass. The Revolution Saints album turned out good, and I’m pleased with it. After that, we started immediately recording the Dead Daisies album. It was a situation where management asked what drummers do you like. Of course, I love Brian (Tichy), but, at the same time, Deen was on top of my list. I put Deen and management in touch with each other, and they hit it off. Then we got together and played some of the demos for the record, and Deen was like, yes, straight up heavy rock and roll. With his experience back in the Shrapnel days, The Daisies is an excellent fit for him. Writing for this album, is it a band effort or only one or two people write? DA: The whole band collaborates. Everone brings in riffs, ideas and we try and develop them. We do what we can to help each idea be the best it can be. It’s cool because a lot of times you’ll be surprised what we come up with. Example, I was joking around, and I was playing this silly riff, and everyone was like, that’s cool. I’m like, are you serious? I made it up on the spot. That is the riff on the song Rise Up which is getting a lot of attention. Nascar and I believe the New York Yankees are using Rise Up. Did you use Marti Frederiksen as the producer for Burn It Down? DA: Yes, we used Marty. We told him what we wanted, and he said, OK, I’ll do that, but I need you guys to let me be in charge and do my thing. That’s what we did. It was done old school. Just like when you have a guy like Martin Birch producing a Whitesnake or a Deep Purple album, he’s in charge. It was his job to make sure the record turned out the way we wanted. That’s how we did Burn it Down because nowadays everyone’s a producer. Everyone has a home studio. Marty wanted to be in control, and we gave that to him. The record turned out great. Is John Corabi playing any guitar on this album or is he only doing vocals? DA: John played a little bit of guitar on this record, but mostly it’s David Lowy and me. John’s super talented guitar player as you probably know, he came up with a bunch of riffs for Burn It Down. There was one of the riffs he came up with, which I think he stole it from me (laughter), but I’ll give him the credit I was playing something, and then John all of a sudden popped out this riff, and I’m like, dude, you stole my riff. John’s a great guy. How’s the Burning Rain project coming? DA: I’ve got the basic tracks cut for burning, burning rain record, which is strong and uh, it’s going to be good. That will be released later this year. I don’t want to announce it yet, but I have a new line up for Burning Rain, and it’s solid. I’m very excited. Are you surprised by the success the Daises have had? DA: We don’t think about it that much. We’re grateful that people are helping move this forward, and we want to make songs and good times for people. We want people to see the show and get to experience what The Dead Daisies are like live. It’s a, it’s a fun show, and you know, with Dean we’re still kind of finding our way with him. He’s a lot of fun, and we’re in the process of learning the songs again with Deen. Did you guys approach Burn it Down differently than the first? DA: We talked about making it a bit heavier and a bit simpler. We wanted to make sure that we were focused on big riffs you could listen to at festivals and rock out too. As a guitar player you come up with these little things that sound cool but live, all those details get lost. So we wanted to focus on big, simple riffs on this and heavier sounding. Are you still playing your ESP Guitars? DA: They’re a fantastic company. They’ve built me a couple of killer Telecaster guitars, and I love them. I have a lot of Gibson guitars bought or traded for. I just got a guitar by John Suhr, and it’s called the Aura Guitar. This is the very first single cut kind of Les Paul Style Guitar that John’s ever made. He made four of them prototypes for the NAMM show in January. I’ve got the first real factory guitar, and it’s insane. Too try and have a Les Paul knocked out of my hand takes a lot. My ESP guitars are killer, but the Aura is a different beast. This Suhr Aura Guitar is a Les Paul killer. What the tour schedule for The Daises in 2018? DA: We’re doing a headline tour in Europe, and we’ve got a few different bands supporting us over there, and we’re also doing some festivals in Europe. I believe we’ll be supporting Judas Priest or whoever is on tour at those festivals. I’m not 100% positive, but Priest is one of the big bands out the summer, so definitely supporting them on some shows. Were supporting Guns And Roses on a show or to Europe. We’re doing a US-run when we’re headlining, and Tyler Bryant is supporting us. Tyler and his band are a great new act. Tyler’s also a great guitarist. Then we were going back to Europe in November, December. I’m not sure who’s playing with this, but I’ve got a couple of bands that I’ve been trying to push to get them on there. So we’ll see what happens. I forgot South America, and we’ll be headlining in Japan. The Dead Daisies new album Burn It Down will be released on April 6th, 2018.